Boom segments from five plate composed of hexagonal structure. Two, three, four, five-section telescopic boom driven organization, you can slide in a basic arm. Single-stage telescopic mechanism by four double-acting cylinder and its supporting components. Valves mounted on telescopic cylinders, which ensures smooth telescopic boom telescoping and retraction due to external forces and prevent accidents in case of an accident when the hose rupture. Luffing mechanism driven by luffing cylinder, used to adjust the arm elevation, and boom with telescopic mechanism, the magnitude of change in work. Valves on the luffing cylinder fitted to ensure smooth movement amplitude, velocity amplitude motion control, to prevent accidents in the event of an accident ruptured hydraulic hoses. First luffing mechanism driven by the first luffing cylinder, used to adjust the angle of the inner arm; second luffing mechanism driven by a second luffing cylinder, used to adjust the angle of the outer arm relative to the inner arm. Rotary support is the inner, outer and middle circle grinding steel balls clamp components. In the fixed leg of the fixed inner and outer rings with a fixed crane turntable. Push the outer ring is rotated by the rotary mechanism. Slewing mechanism by hydraulic motors and rotary gear composition, can promote continuous turntable rotation. The operating mechanism is mainly composed on off control valve and joystick mounted on both sides of the frame components. On the handle mounting bracket has action and movement directions of the hydraulic actuator instruction signs, the operator should follow the instructions of the signs of the corresponding location. Leg portion including the former case and fixed legs legs before the event and after the event after a fixed box and legs. 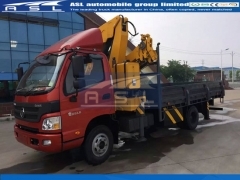 Activities by the horizontal leg legs, vertical leg cylinders and vertical legs flip bodies, truck mounted crane when traveling, vertical leg 180 ° flip and active contraction of the fixed leg legs box. When the lifting operation, now rotary valve handle to pull the legs of the horizontal leg of the icon, then pulled off the active valve control handle legs stretched out; and then pull the handle to the vertical rotary valve leg icon Department again pulled off valve joystick vertical legs flip 180 °; vertical leg and then pulled the joystick left and right, respectively, to adjust the amount of vertical legs protruding cylinder, so that the level of the legs. 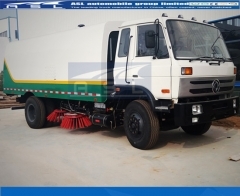 PTO device consists of power take off, connecting shaft, gear pumps and other components, the engine power through the clutch, gearbox passed PTO, PTO shaft by connecting power to the pump. Hydraulic oil pump output to drive each hydraulic actuator. PTO engagement and separated by a cab driver's seat in the lower left of the manual valve to control; when you need lifting operation, start the engine, the clutch pedal is depressed, then turn the manual valve position to take power, then slowly release the clutch pedal, then the PTO engaged state, pump work. 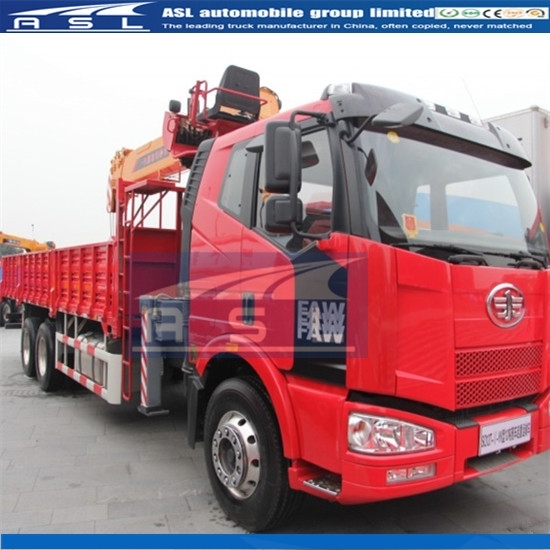 After the lifting operation, depress the clutch pedal, turn the manual valve to the disengaged position, even if the pump power take-off status. PTO working pressure for 0.5-0.6Mpa, PTO device is only allowed when the lifting operation must be disengaged when driving. Note: After taking power the engine speed should not exceed 1000rpm! j. tire inflation pressure should be consistent with the provisions of the front wheels for 441Kpa, the rear wheels for 617Kpa. If the arm length and the amplitude does not conform to the operating position in Fig. 7 a given value, in this case from both sides of the weight values should be smaller, or a weighted average calculation. When in a semi-retractable telescopic state, determined by the weighted average method lifting quality. d. On both sides of the frame has a different set of lifting operation lever, the order and function exactly the same on both sides of the joystick. First rotary selector valve box on legs fixed to the horizontal leg grip position, and then pulled off control valve corresponding outrigger beam extends handle make proper position (middle position or maximum position), rotary selector valve handle to the vertical leg position, then pulled off the corresponding control valve handle in the vertical leg 180 ° flip down perpendicular to the ground. Then pulled off alternately operated valve left and right vertical lever leg cylinder respectively, the vertical leg cylinder piston rod, the car rose to its front wheels and the frame just not force level, that is, crane working condition. When the store legs above the opposite program operation. c. When Crane travel must be active legs back, and with the positioning pin lock. d. Do unsupported legs for lifting operations, the job of each leg of the pin must sell well. Lifting operations must be checked in advance and after the completion of the preparatory work before proceeding. May not operate with a luffing crane or drag heavy objects off the ground yet, be sure to vertical lifting, weight shall not be stayed. b. When lifting heavy objects, generally should not Telescopic Boom. b. When turning, turning in the area without any obstacles. Note: 1. 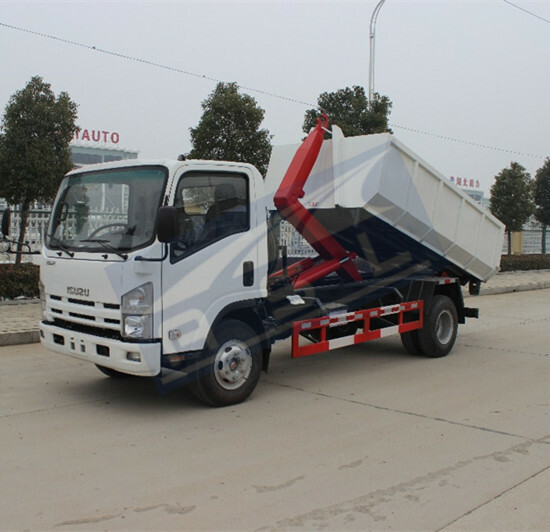 To ensure that there is enough space to fully open the left and right leg, and according to the weight of the cargo from the cargo parked in the appropriate position when set. 2. manipulate the process: the clutch pedal, the shift lever into the neutral position, start the car, then the PTO PTO manual valve is turned to the position, and then slowly release the clutch pedal, then the PTO in working condition.
! Warning: When operating retractable legs, when four cylinders DCV40 / 5-Z Multi-way valve switching valve handle at the same time in the middle position, the ban flip reversing lever to prevent the pump for a long time at high load conditions. Note: the operation should pay attention to the crane is placed higher than the open position, in order to ensure that the operator has the best perspective and safe operation. Open Activity leg locking device. (Use of the device are detailed in the safety locking device). Extended support crane outrigger cylinder. Open the inner, outer arm crane turntable rotation.
! 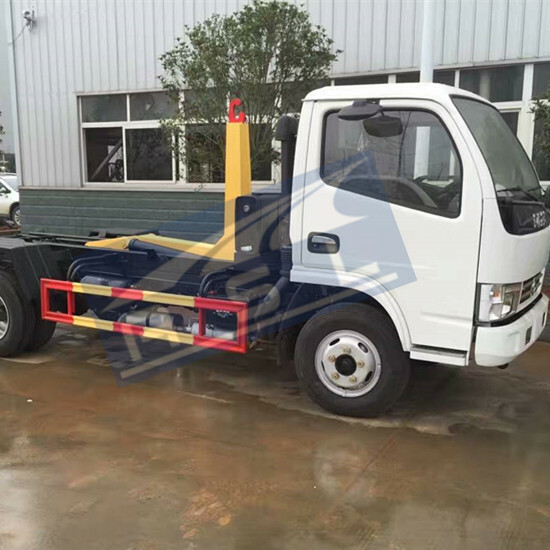 Warning: When the general fixed crane truck, should make active leg is fully extended, the vertical leg of the ground and does not make the car fuel tank float. All car wheels should touch the ground. This chapter describes all sports cranes (action) and the correct sequence of operations to expand and use the crane. WARNING: Crane stops (rest, rest) should be in a state supported on a fixed anchor leg to prevent the crane boom slewing and may vary depending on the gravity displacement. 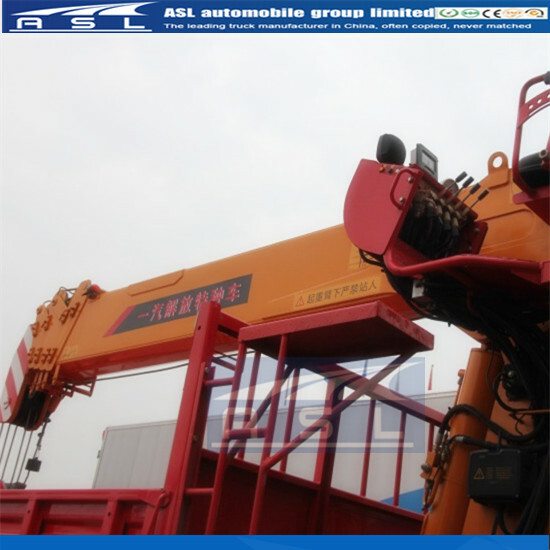 When the crane start lever should be pulled in the arm, so that the inner arm lifting off the points of support. When the inner arm lifting the outer arm to start when there is enough space to open the outer arm, telescopic movement, rotating turntable. 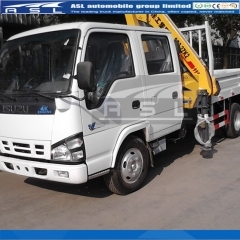 According to the instructions telescopic steering lever, telescopic movement will stretch. Before lifting the goods, you must estimate the weight of the goods (the value to the rated load lifting torque compared) and calculate the distance between the point of the line of goods declined. When down cargo operations to be slow, accurate ground and can not swing, careful not to let the goods hit the crane or car. In order to improve the life of cranes, telescopic boom should be avoided in the case of outstretched, load rotating turntable. Preferably before the rotation, the telescopic boom reduced to a minimum. After hanging goods, should avoid sudden starts and stops, because the crane structure would generate unnecessary stress. Note: For multi-section telescopic boom, the telescopic steering handle is still the same handle. a telescopic boom collapsed: flip telescopic joystick, outriggers fully retracted. b folded outer arm: the outer arm lever pulled, folded outer arm. C turntable rotation: rotate the turntable until the inner and outer arms parallel to the fixed leg. d folded inner arm: the boom lever is pulled, the inner arm gradually decreases, to the inner, outer arm falls on the fixed leg support. e folded legs: the first collection vertical leg, and then received the level of the legs. Warning: The legs must be fully retracted. Note: Be sure to ensure that activities legs fully retracted, and get off control valve to check whether all the handles are back in place. 1. Work should be completed with hydraulic power take off unit. 2. The operation is completed, to check whether the joystick automatically reset, if the handle is not in the position to bring it back in place. · Unless there are other guards, otherwise, in the vicinity of power lines operating the crane at least to maintain a distance of 5 meters. · Operating the crane site ground must be firm, smooth, tilt is not greater than 1:20, the work process can not ground subsidence. Before using a crane, in order to work more safely, to estimate the ambient environmental conditions (wind, temperature, lightning). Crane sling (cable) should not be lifting the goods when the angle is too small (Figure 1) or too large (Figure 2), should not exceed the maximum angle 120º, otherwise, the sling tension of too easily broken, the angle is too small so long sling. 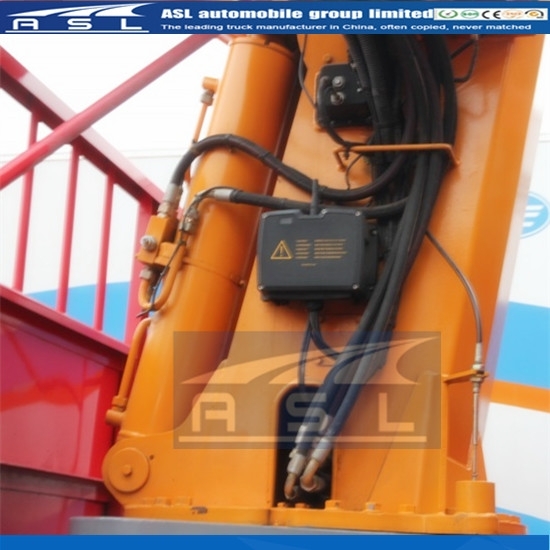 * The operator must have a thorough understanding of the crane, and let the crane to maintain high efficiency state, if there is doubt, please consult this manual carefully. · Only after operator training before they can use and operate the crane. • When lifting or loading crane operation, not allowed to leave the console. 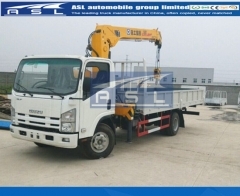 · Allow the operator can not enter without the operating range of the crane. · Hanging heavy, non-simultaneous operation of two mechanisms. 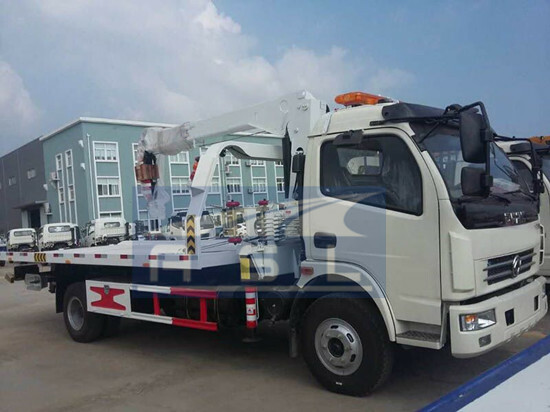 • To make the load distribution, not in the ditch or soft, ground handling crane collapse. When working on soft ground, must be placed between the legs and the floor of a support plate (such as wood, iron, etc.) in order to increase the bearing area. • The operator should be able to upgrade a rough estimate of the weight of the load can not exceed the crane load chart the calibration load value. • Use the steering control on the side of the load, in order to observe the state of motion loads more clearly. • Do not stand in the matter of lifting people. • allowed angled lifting loads, ensure that the load is securely. • When the load off the ground, to make sure there are no obstacles in the direction of travel of the load. • allowed to haul loads or stayed, buried in the ground are not allowed to lift heavy objects or freeze the ground. • The load may rotate at a certain distance should load with a rope tow. • Unless there are security measures, otherwise prohibited the use of a crane lifting people. • Before beginning the lifting operation, be sure to check lifting devices (ropes, hooks, chains or belts), whether through safe design, meets your requirements for lifting goods, for insurance and security, cargo should be firmly fixed. 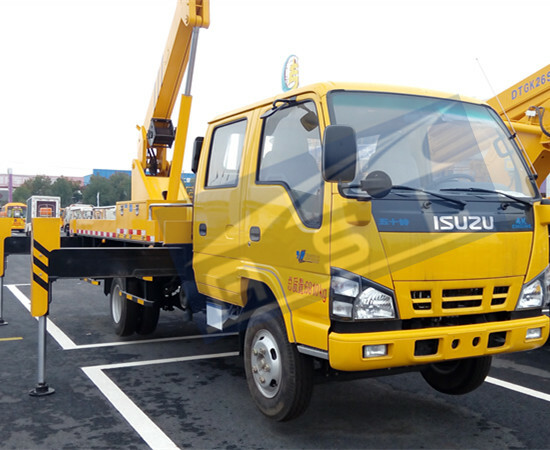 • Before moving vehicles, cranes must be fully retracted and locked. Hose failure in the power circuit and in lack of engine power, the control valve is still able to control the load current position and can play a security role. 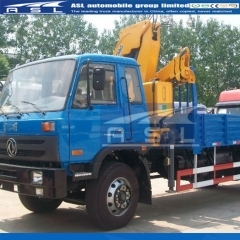 1: Chassis car use by truck maintenance and repair manual execution. c. When refueling, the oil should be controlled within a range of oil underlying scale. In the driving state of the exposed portion of the cylinder rod, grease should be applied once a month. • Where marked with * following maintenance must be carried out by the manufacturer. • Maintenance work must be carried out in the car is turned off and the main operation switch off. • The overhaul had before the pressure line, first by changing the joystick always release the pressure (engine stopped). • Keep all handles, pedals and countertops no oil, and add slip agents to prevent it from slipping. • when cleaning crane electrical components and electrical connections to protect them, because the jet will damage electrical equipment. • Therefore, we recommend that you make regular checks on the whole, to see whether the normal conditions for protection, if necessary, to be reprocessed. • During maintenance, overhaul completed before starting the crane to check whether there are tools, rags, or some other things lost in the moving parts. 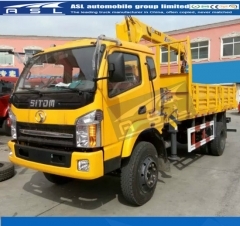 2: FAW 8Tons Boom Truck Mounted Cranes Crane is not used in a long time (usually six months or more), you should take the following maintenance, custody measure. _ Wipe dirt and grease the body, keeping the body clean. _ All cylinder piston rod retracted position to a minimum. _ Apply grease all moving parts. Should generally be placed in ventilated and dry warehouse, such as open-air place, apply waterproof cloth cover. _ Start once a month, and idling agencies, to observe whether normal. All joints must be lubricated periodically, to a certain pressure injection of lubricating oil, lubricating oil until overflow from between the two connectors. After refueling, all joints should be carried out several times a complete action, and then give a little more oil. The telescopic boom crane fully extended, on the outside of the three section telescopic boom smear butter, before applying the new oil must be scraped off with a rubber original old butter knife. Then brush the overhanging the entire outer surface coating layer of butter. First crane parked in fully recovered state, to find a large enough container to install the hydraulic oil tank and put it in the bottom of the tank, open the drain plug at the bottom of the hydraulic tank, allowing the hydraulic oil completely drained, replace the plug and to ensure plugged. Note: maintain proper vigilance to prevent contact with the hot oil combustion hazards occur. Oil filter should be changed regularly, found blockage should always be replaced. Note: When replacing, care must be taken to prevent contact with the hot oil to prevent the occurrence of fire danger. Seal between the cap and filter body position is correct, cover the filter cover. Start once a month, and idling agencies, sees if normal.